With spring well underway and summer around the corner, people with hay fever may feel desperate for relief, and their numbers continue to grow. Experts from the American College of Allergy, Asthma & Immunology (ACAAI) estimated that about 50 million people live with hay fever, which are also known as nasal allergies or allergic rhinitis. Nearly 30 percent of adults and up to 40 percent of children have been diagnosed with some type of seasonal allergy. In the past year, more than 13.4 million of these people ended up in doctors’ offices, outpatient clinics and emergency rooms because of hay fever attacks. These trends underscore the importance of exploring alternative options for the prevention and treatment of nasal allergies. While there are a number of eye drops, nose sprays and oral medications on the market, such as antihistamines, several medical product companies have also developed solutions that prevent allergens from entering the nasal passages in the first place. These wearable nasal filters are devices that either adhere to the inside of your nose or are clipped to the septum. The idea behind these newer technologies is to screen out any pollen, dust, mold spores or other triggers that can stimulate the runny nose, sneezing, watery eyes and itchiness that are characteristic of hay fever. One recent study evaluated the effectiveness of such products in a clinical trial that compared similar devices for the nose. In the trial, only one of the devices actually had a filter. Results showed the filtered device was far more effective in preventing throat irritation and runny noses. Furthermore, subjects who wore the filters got used to wearing them within an hour. While nasal filters are one option, other approaches may include medications or immunotherapy. Immunotherapy is a treatment in which doctors administer regimented doses of allergens to patients, whose immune systems then gradually become less sensitive to the triggers. 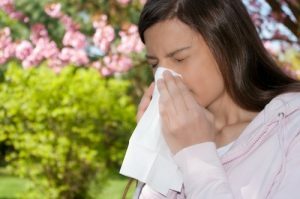 The ACAAI noted that immunotherapy effectively reduces symptoms in 85 percent of hay fever patients. It is also important to avoid allergy triggers. You should pay attention to pollen counts instead of pollen forecasts, which are based on pollen counts from the previous year. Hay fever drugs taken prior to allergen exposure can allow time for the medication to exert its protective effects. Keep allergens out of the house by closing windows and using air conditioning during high pollen count season. Using a saline rinse can thin excessive mucus and remove allergens. Commercial solutions are available, or patients can make their own. If you are looking for better allergy relief, it is generally best to consult a medical specialist who is knowledgeable about allergies. A specialist can help you to determine your allergy triggers and what personalized treatments may work best for you.